Round 2 for the socials this year! 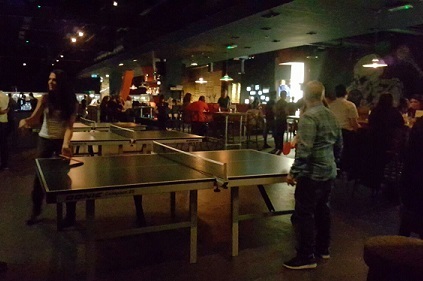 We’re heading to Ping Pong at The Bat and Ball at Westfield (Stratford). Drinks: 9:00pm hang around or go to ‘The Cow’, nearby. The Bat and Ball serve food and drink, so if you’d like to relax and watch only, you can. There are a couple of sofas and small tables dotted around in the ping-pong area. Warning: you will be hit by a ball! Based on eight people per ping pong table hogging one for two hours, the minimum to pay will be £6.25 each. This may vary according to the number of people joining us. We’ll get back to the respondents approximately three weeks before the event with the final cost if enough people get in touch.